One of the problems with a steel house is that it is not something that the average home builder is familiar with. On the other hand commercial general contractors who are familiar with steel construction are not typically geared up to do a structure as small as a house. The unfortunate result is simply that the construction cost inflates. 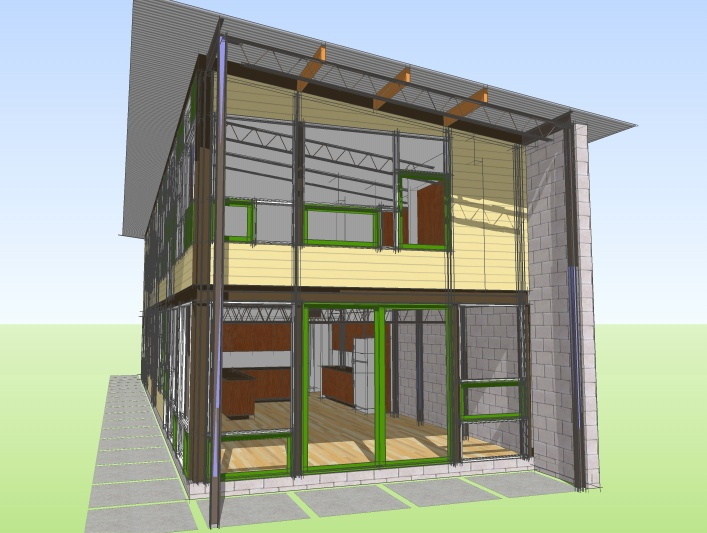 The Steel Case house is designed to alleviate this situation by allowing the steel fabrication and erection to fit into the construction sequence typical to a wood framed house. The usual sequence is concrete footings followed by masonry foundation walls, after which carpenters can take over the completion of the house. With the Steel Case house the entire steel frame is erected following the footings. After this the masons and carpenters follow in a normal sequence, albeit with the carpenters framing tasks much reduced. In keeping with its designation as a Remote plan the house is designed to be oriented towards a favorable view. One side of the house is almost entirely windows, placing the interior into the landscape. The other side of the house is almost entirely solid, creating a strong barrier like threshold at the entry to the house. When siting the house it is recommended that this solid wall be aligned with some natural feature such as the edge of a tree line, or a ridge overlooking a view with the solid wall facing the approach to the house. In this way the wall will provide privacy for the house, and a dramatic doorway to the view that the house enjoys. The house is both symmetrical and asymmetrical at the same time. 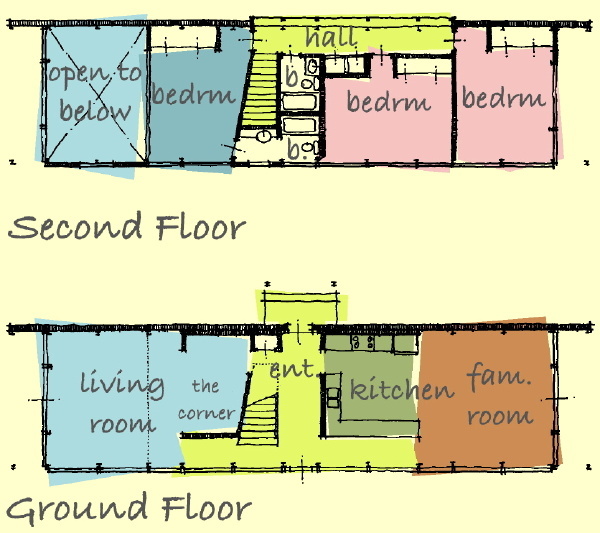 The overall size of the house is quite modest, yet the spaces are generously sized. You won't find the status quo features of developer housing here. There is no ground floor powder room, and the bathrooms are modest in size. There is no attached garage or giant master bedroom suite with walk in closets. 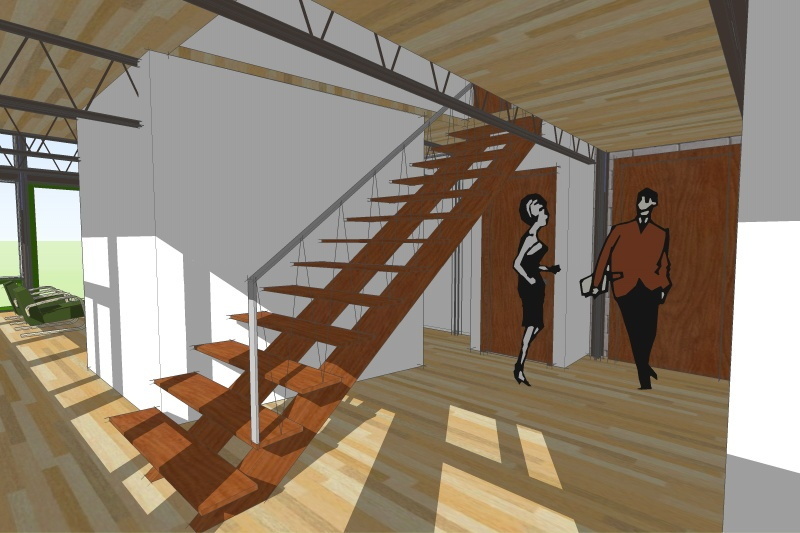 The floor plan is simple, open and loft like, with spaces flowing into one another. The living room is double height with vast windows to overlook the landscape. Off of the living room is a smaller scaled space called the corner. It is the perfect spot for a special place to sit, whether for a comfortable chair or your desk for your computer and internet connection. The kitchen is wide open to the family room, and both spaces also have numerous windows for viewing the landscape. Upstairs there are three good sized bedrooms, with one overlooking the living room. 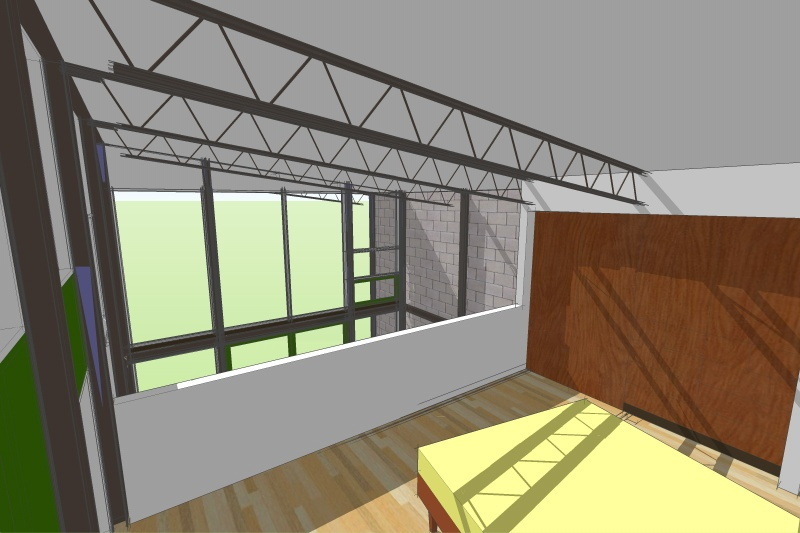 This loft like bedroom has its own private bath making it a good master bedroom, or a study/guest room. The steel frame construction is exposed and evident throughout the house. 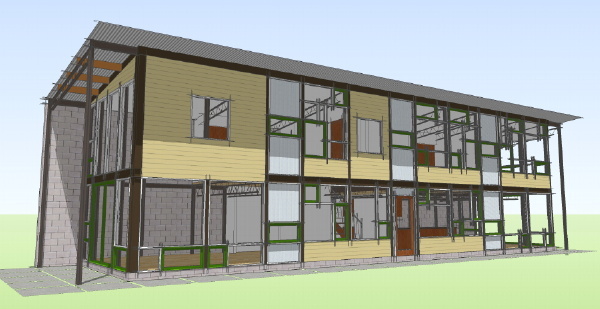 It is an exciting plan that shrugs off the baggage of today's spec built housing. 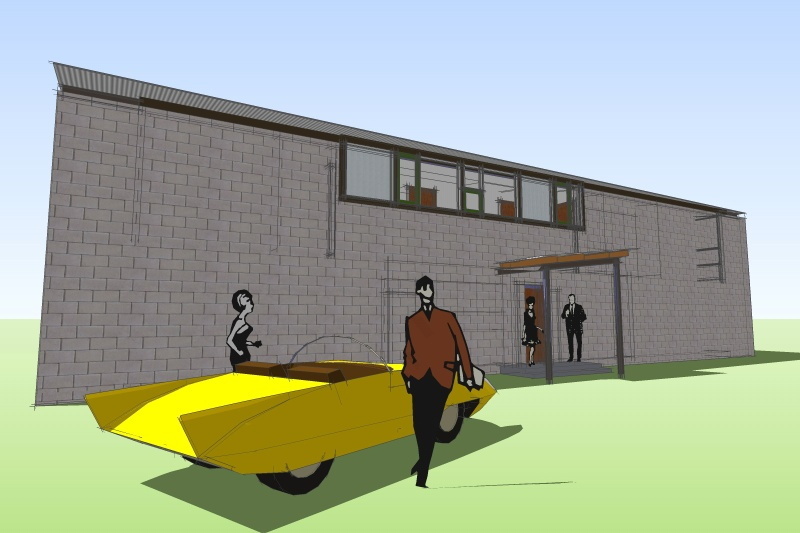 The Steel Case House has emerged out of requests from early visitors to the site for a steel house that was a "simple box". This request has been repeated many times. For inspiration we turned to the Case Study houses built in the late 1940s and 50s by Arts and Architecture magazine. Case Study house number 8, the Eames House is probably the quintessential "simple steel box" and is a point of inspiration for this design. When the Case Study houses were built it was hoped that the industrial might of the US built up during WW2 could now turn to producing modern houses of standardized industrial components at a scale that would make them affordable. As we all know that industry never materialized, and stick framed houses remain the status quo. We see this design as an evolution of the Case Study goals. 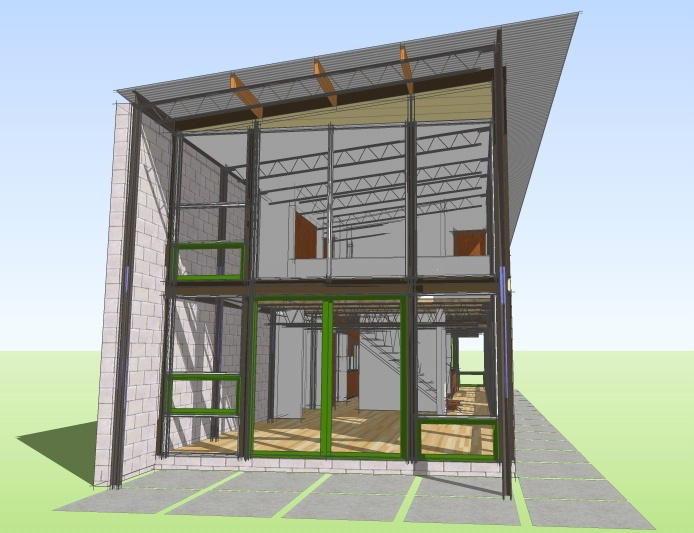 By combining readily available residential building components with a simple steel frame we hope to arrive at a hybrid that makes the house easier to realize. 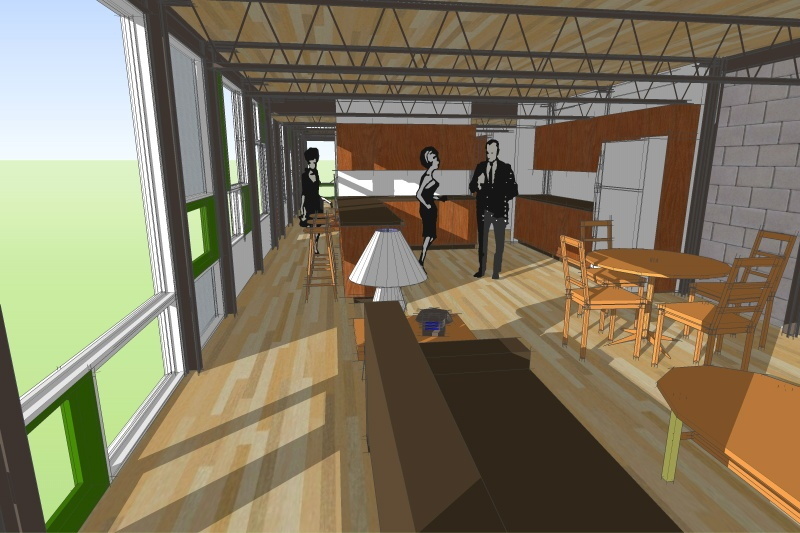 Also see these variations on the Steel Case House: the SIPs Edition for colder climates, the Metal Edition for an all steel house, or the Timber Case House for an all wood version of this unique house. Facts: Two story steel framed dwelling with a crawlspace foundation, and a sloped corrugated metal roof. 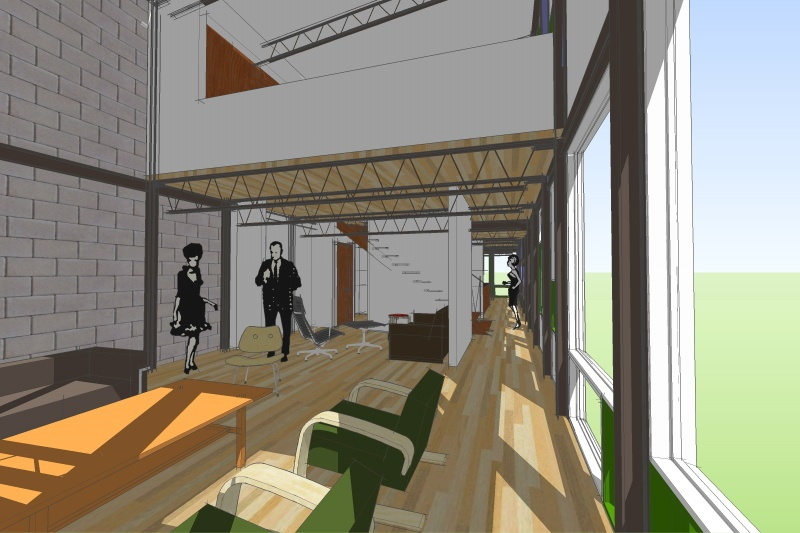 Ground floor spaces include the entry, living room, family room, kitchen, and "the corner". Second floor spaces include three bedrooms, two full bathroom, and the hall with laundry closet. 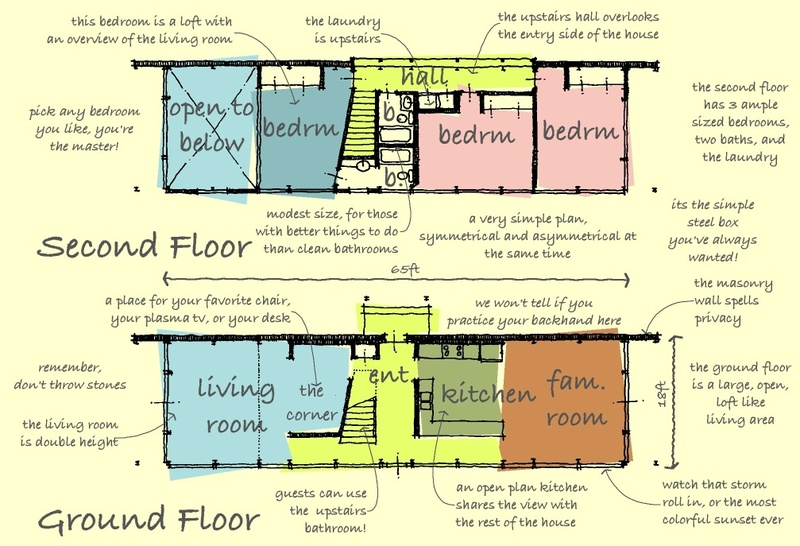 Square footage: calculations are for primary conditioned living space and do not include basements, porches, terraces, or other outdoor space.